Clutching his Oscar statuette for best animated feature film “Spiderman: Into the Spider-Verse,” co-director Rodney Rothman had one piece of advice tonight for other filmmakers. “Put Mahershala Ali in your movie. It seems to work out,” Rothman said backstage Sunday night at the Dolby Theatre. Ali, who had a supporting voiceover role in “Spiderman,” won the best supporting actor Oscar earlier in the evening for “Green Book.” It was Ali’s second win in the category in two years. 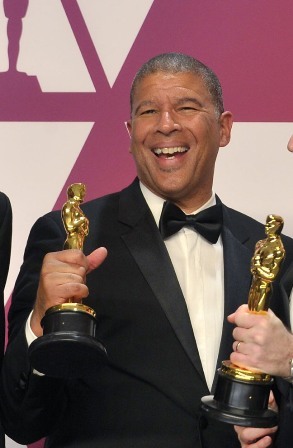 Rothman said he and the other filmmakers — he shared the Oscar win with Bob Perischetti, Peter Ramsey, Phil Lord and Christopher Miller — tried to cast actors who had a naturalistic style of performing, and that Ali was a great example. Rothman said that — spoiler alert — Ali has a death scene in the film, and that after performing the scene twice, he was later asked to do it a third time. “He basically said no. He in a calm, real articulate way said that for him to do that kind of scene takes a lot of effort and it takes a lot out of him,” Rothman said. Ramsey said the filmmakers “felt the importance” of having a main character in the superhero movie be a half-Puerto Rican and half-African American kid. “Miles had a lot of backup, he had a lot of people who really loved him as a character and who believed in the story and knew how important it was going to be to black kids, Latino kids, kids who just want to be their best selves no matter who they are,” he said.